Limiting machine downtimes is a key factor for the production efficiency. In Wielton, a manufacturer of semi-trailers, where many materials, including sheet metal, are processed, this issue is especially important. The problem has been solved with a stacker crane and an automated warehouse. Wielton has many suppliers. These are manufacturers of axles and suspensions, tyres and rims, braking systems, power hydraulics, plywood, paints and varnishes. Steel and aluminium sheets are particularly important because they are main materials used in every semi-trailer, especially dump trucks. The list of suppliers includes producers or distributors of steel sheets and sections such as SSAB EMEA, ThyssenKrupp Energostal, ArcelorMittal, VoestAlpine Krems, Stalprodukt Centrostal, and the manufacturers of aluminium sheets and sections: Grupa Kęty, Sapa Aluminium, Alcoa EMEA. The factory processes over one thousand tonnes of metal sheets a month. It is a huge challenge to control these heavy and not very “handy” components. A few years ago, the sheets brought to the factory were stored on the racks located in several halls, away from the machine tools. Hence the process of feeding the machines with the material was time consuming and hard to control. The sheets had to be transported which resulted in high costs of internal logistics. It was also difficult to ensure continuous production at all times, which required the appropriate use of the laser cutters used in the factory. The company has decided to introduce changes. It built a warehouse suitable for storage of both 1.5 x 3 m and 6 x 2 m sheet formats. 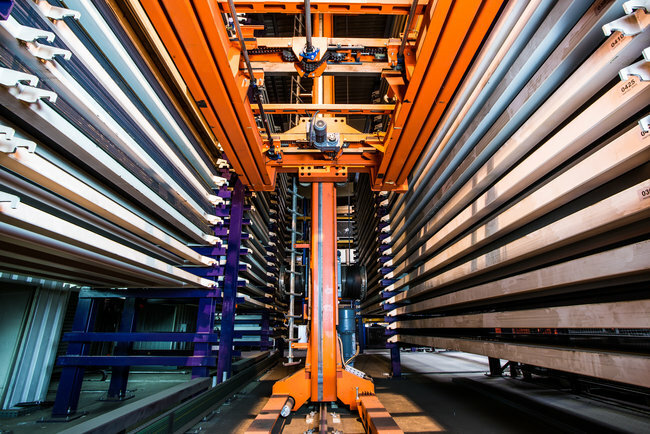 The warehouse is automated, and the installation is integrated with four lasers. The raw material is automatically fed to the cutters when needed to ensure their continuous work. So, there are practically no downtimes. 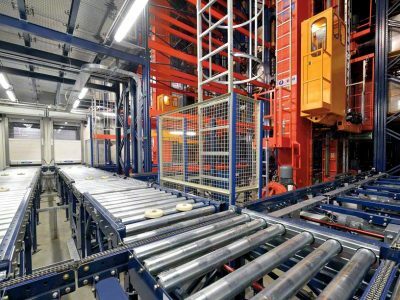 The reduction of downtimes was not the only reason for choosing the automated sheet metal warehouse. Another goal was to increase the storage space and gain more area for production. The automated warehouse does not need a lot of space. Its dimensions are 72.5 x 7.7 x 7.5 m (length. x width. x height.). 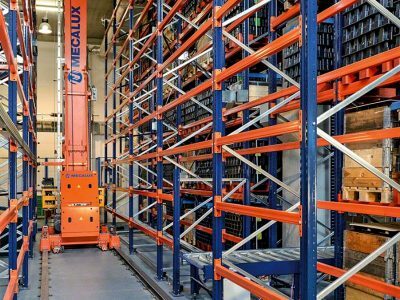 Inside there are 356 storage spaces with dimensions of 3 x 1.5 m, and 90 storage spaces of 6 x 2 m. In both cases, the payload of each of the pallet spaces is 5 t. In total, on about 560 square metres, the company can store 1.6 thousand tonnes of sheet metal. The warehouse is operated with the use of a central loading station, four unloading stations supplying the raw sheets directly to the laser cutters, and an unloading station providing three other machines with the material. Four Bystronic laser cutters are directly connected to the warehouse system and automatically provided with raw sheets by ByLoaders. 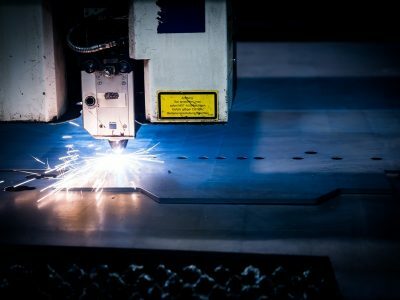 Two other laser cutters: Bystronic and Trumpf and a plasma cutter are supplied by a separate station and a lifting equipment with suction pads. The whole system is under the “care” of PRO WMS Enterprise software (including SAP interface). The need to use internal transport means is practically eliminated. Saving area is only one of many benefits. With the automated process, the intake of materials by the machines is much faster and safer. The highly efficient stacker crane performs about 20 double cycles per minute. Previously, the sheets were transported from the storage zones to the machine tools with a forklift truck. Now, all you need to do is to push the button to have the raw materials transported by the stacker crane to the selected storage station in minutes. The access time has been significantly reduced. With this solution, we have obtained sufficient area to develop our production department and increase the number of cutters from four to six. At the same time, the machines’ efficiency has been boosted thanks to the fact that they do not have to wait for the material anymore,” said Tomasz Swędrak, the Technical Director in Wielton. He also underlines that the company was focused on both flexibility and efficiency of the system, adaptation to the work with two formats of sheets and the option to add a laser cutter of any other producer in the future. Currently, four cutters are fed with sheet metal directly by the automated warehouse, while two other cutters and the plasma cutter are supported by a separate station. 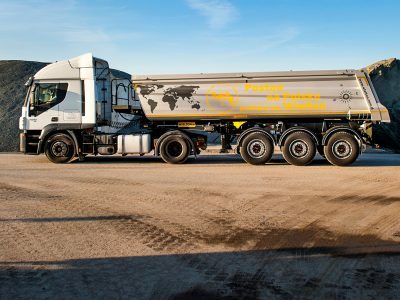 This way, we do not disrupt directly connected production processes, and all the seven machines continuously get the necessary materials,” said Paweł Zieliński, the General Manager for Eastern Europe in Remmert.